Why buy bottled salad dressing when it is so easy to make your own? A wonderful dressing can easily be whipped up in a few minutes. Most dressing ingredients are staples that you probably have in your pantry right now. Homemade dressings are less expensive than bottled versions and there are no preservatives, stabilizers, and artificial flavors. There is no waste with homemade dressings since you only make the amount you need. Or you can make enough dressing for a few days and store it in a container with a lid in your refrigerator; just shake it well before using. There are basically 2 types of salad dressings, vinaigrettes and creamy dressings. 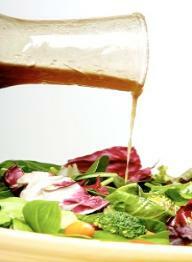 The usual proportions for a basic vinaigrette dressing are three parts oil to one part vinegar or lemon juice. Use extra-virgin olive oil when olive oil is the required ingredient, a good-quality vinegar, Kosher or sea salt, and freshly ground black pepper. Only use freshly squeezed lemon or lime juice in your salad dressings. The bottled versions do not have the same bright, citrus flavor. Some recipes that use canola or vegetable oil as an ingredient, do so because it has little flavor and will not compete with the other ingredients in the dressing. Try some different combinations like walnut oil, lemon-infused olive oil, or fruit flavored oil with white wine vinegar. There are also some wonderfully flavored vinegars that can be blended with olive oil for a quick and delicious dressing. Vinaigrettes: To emulsify a vinaigrette means to combine two liquids, oil and vinegar, that normally do not mix smoothly. This is done by slowly adding one ingredient to another while whisking rapidly. Emulsifying disperses and suspends one liquid throughout another. If your vinaigrette separates, just whisk it back together. Vinaigrettes will keep in the refrigerator for up to 2 weeks. Since the oil and vinegar will separate, just whisk it to re-emulsify. If you store it in a container with a lid, all you need to do is shake it vigorously. If the oil has solidified, let the vinaigrette come back to room temperature before re-emulsifying. Creamy Dressings: A creamy salad dressing may also contain oil and vinegar but it will also have some type of thickening ingredient. Whole eggs, egg yolks, mayonnaise, sour cream, buttermilk, pureed fruits and vegetables are just some of the items that will the dressing a creamy texture. grain salads. It can also be used on grilled vegetables. When making a vinaigrette, always start with the vinegar and salt first. If you are using mustard, add that next. Then slowly whisk in the oil. Finally add the garlic and/or herbs. Taste and season with salt and pepper. Test by dipping a leaf into the dressing to check the acid and salt balance. A basic vinaigrette that can be used to dress most types of lettuce or greens. Whisk together the red wine vinegar, minced red onion, Dijon mustard, and garlic clove. Slowly whisk in the oil and season with salt and pepper. This vinaigrette pairs well with a tender leaf lettuce such as Bibb. Whisk together the vinegar and shallot. Slowly add the oil until the mixture is well blended. Serve with arugula, fresh figs, goat cheese, and crisp pancetta. Whisk together the vinegar and mustard. Slowly whisk in the olive oil. Season with salt and pepper. This is a light-flavored dressing for tender leaf lettuce varieties. Add wedges of orange or artichoke hearts to the salad. The dressing is also nice over roasted beets or fennel. Place the tomatoes, balsamic vinegar, red wine vinegar, and garlic in a blender or food processor. Puree until smooth. Slowly add the oil until well blended. Season with salt and pepper. Serve with baby spinach leaves, orange sections, and slices of avocado. For a main course salad, add grilled chicken, shrimp, or salmon. This dressing is best made in a food processor. Serve with spinach leaves, cooked peas, and pine nuts, with a potato salad, or a pasta salad. With food processor running, drop garlic clove through the feed tube. Add cheese, basil, parsley, salt, sugar, and pepper. Process about 10 seconds until all the ingredients are finely chopped. Combine the oil and vinegar. With the machine running, slowly pour through the feed tube. The mixture will combine very quickly. It should be slightly thick and coarse. Adjust the hot sauce to your taste. For a traditional Greek Salad, serve with shredded iceberg or romaine lettuce, sliced or diced cucumbers, tomato wedges, black olives, and crumbled feta cheese. Use lemon zest when baking sweets, making salad dressings or marinades, or for sprinkling on roasted vegetables. The outermost layer of a lemon rind is full of aromatic essential oil that can liven up dishes, desserts,and drinks. Rub a lemon against a rasp or grater with very small holes, rotating the fruit as soon as the white pith appears. One lemon should yield 2 to 3 teaspoons of fluffy zest. Roasting garlic mellows its sharp flavor and lends it a sweet, caramelized taste, Stir it into salad dressings, spread it on sandwiches, or add it to dips or pizza. garlic to expose the cloves. 3. Place the garlic head on a square of aluminum foil. Drizzle with olive oil. Wrap the foil to enclose the garlic. 4. Bake for 40 to 45 minutes. 5. To extract the roasted cloves, grab the bottom of the head and gently squeeze until the cloves pop out. They should be soft and golden brown. 6. 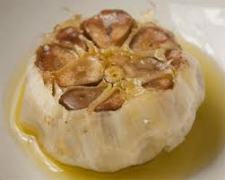 Roasted garlic cloves may be refrigerated for up to 2 weeks. Traditional and contemporary Italian recipes for vegetarian and nearly vegetarian dishes from the author of The Italian Slow Cooker. In this book, Italian cooking authority Michele Scicolone shares recipes that she gathered during years of traveling in Italy.